AP-2 is a member of the AP family of heterotetrameric adaptor complexes (termed AP 1-4). APs are found in all nucleated cells from yeast to humans and share a similar overall quaternary structure (Kirchhausen 1999). Two isoforms of the AP-1 complex are components of CCVs originating from the trans-Golgi network (TGN)/recycling endosomal boundary. Of these, the AP-1B complex is only found in polarized epithelial cells where it regulates basolateral delivery of membrane cargo, such as the LDL receptor (Kirchhausen 1999). The AP-3 family member is associated mainly with endosomal membranes, and AP-4 is linked to membranes of the TGN (Boehm and Bonifacino 2001; Kirchhausen 1999). Whether AP-3 and AP-4 associate with clathrin in vivo remains uncertain, and perhaps unlikely. AP complexes share a common architecture and subunit structure. Each complex contains two large subunits (y1 and P1 for AP-1, a and P2 for AP-2, 5 and P3 for AP3-, e and P4 for AP-4; each about 100 kD), one medium (|1, |2, |3, ||4; 50 kD each), and one small chain (o1, o2, o3, o4; 20 kD each) (Boehm and Bonifacino 2001; Kirchhausen 1999; Robinson and Bonifacino 2001). 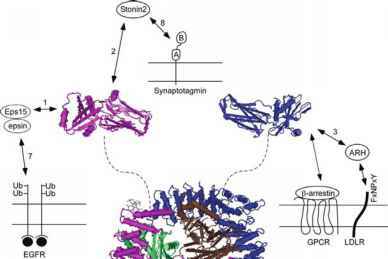 Parts of the two large subunits together with o and the amino-terminal domain of | form a compact solenoid core that is connected via flexible hinges to the appendage or ear domains. The ears, which are encoded by the two large adaptin genes, represent flexible protein-protein interaction platforms that bind to simple peptide motifs contained within natively unfolded domains of accessory endocytic factors (discussed in detail below). (Heuser and Keen 1988). Like other adaptors, the AP-2 complex consists of two large subunits of 100-130 kda (a and p2), one medium chain of 50 kDa (|2), and a small subunit of about 17-20 kDa (o2) (Kirchhausen 1999). The large subunits form the majority of the trunk (70 kDa), as well as the appendage domains (30 kDa). These are connected by flexible, proteolytically sensitive linkers or hinge regions. o2 and |2 are also embedded into the AP-2 core. The structures of the AP-2 core and the ear domains have been solved by X-ray crystallography (Fig. 1). The AP2-core structure resembles a rectangle, where the trunk domains of a and P2 subunits are on the outside. These represent structurally similar, highly curved a-helical solenoids. The small subunit o2 and the N-terminal |2 domain display a/p folds and are nested into the "elbows" of a- and p2-adaptins, respectively. Thus, the AP-2 core can be considered structurally as a dimer of two related a/o2 and p2/|2 heteromers. In the closed, presumably inactive conformation of AP-2, the p2/N-| 2 heterodimer forms a shallow dish, in which the | 2-C-terminal domain sits (Collins et al. 2002). The folds of o2 and N-|2 are structurally very similar, suggesting that they may fulfill a stabilizing role within the AP-2 complex. The N-and C-terminal domains (C-| 2) of | 2 are connected with each other via a flexible linker (similar to the linker that connects the a and p2 appendage or ear domains to the core) that contains a single phosphorylation site. This site is suggested to be of functional importance for the activation of AP-2 during endocytic cargo recognition and coat assembly (Ricotta et al. 2002), because the C-terminal domain of |2 harbors the binding site for Yxx© signals within cargo membrane receptors (Ohno et al. 1995; Owen and Evans 1998). Comparison of the crystal structure of free C-|2 complexed with Yxx0-cargo peptides and C-|2 contained within the AP-2 core indicates that the tyrosine binding pocket is preformed, but occluded within non-phosphorylated AP-2 by residues derived from p2 (Collins et al. 2002). If cargo proteins bearing a Yxx© motif are to associate with C-|2, a conformational change must occur. This change is presumably triggered by phosphorylation of Thr156, a modification that has been demonstrated to result in a dramatic increase in the affinity for endocytic sorting signals (Ricotta et al. 2002). Cargo recognition is also dependent on phosphatidylinositol 4,5-bisphosphate, which interacts with AP-2 via two independent sites at the amino-terminal end of a and on the surface of C-| 2 (Honing et al. 2005) and is further discussed below. C-| 2 (Owen and Evans 1998) consists of an elongated banana-shaped all p-sheet structure that can be considered as two p-sandwich domains (A and B). Hydrophobic pockets provided by F174 and W421 on the surface of subdomain A accommodate the Y and 0 positions of tyrosine motif peptides, which associate with |2 in an extended conformation (Owen and Evans 1998). In some cases, additional contacts by a third hydrophobic residue upstream of Yxx0 may lead to further stabilization and enhanced affinity of tyrosine signals for AP-2| (Owen et al. 2001). Fig. 1 Three-dimensional structure of the AP-2 adaptor complex and schematic representation of select binding partners. The a subunit is shown in pink, |32 in blue, o2 in green and |l2 in brown (PDB:1GW5). During recognition of Yxx0-based endocytic sorting signals, AP-2 is predicted to undergo a conformational change such that the banana-shaped C-terminal domain of |l2 (schematically depicted in brown) undergoes a rotational movement towards the membrane for interaction with PIP2 (not shown) and cargo. Dotted lines represent the hinge regions of a and |32 subunits. Appendage domains (PDB:2G30 and PDB:1QTP) are colored identically to the corresponding trunk domains. Protein-protein interactions are assigned with numbers referred to in the text. 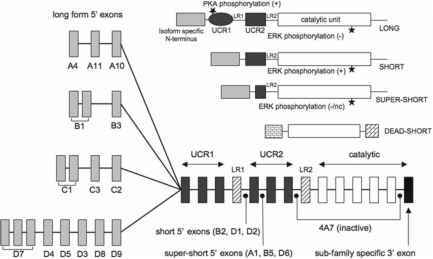 CD3 , Y subunit of T cell antigen CD3; TfR, transferrin receptor; EGFR, epidermal growth factor receptor; AMPAR, alpha-amino-3-hydroxy-5-methyl-4-isoxazole propionic acid (AMPA)-type glutamate-receptor with segments S1 and S2, cytoplasmic domain (C), and an amino-terminal ligand binding domain (N); GPCR, G-protein-coupled receptor; LDLR, low-density lipoprotein receptor; ARH, autosomal recessive hypercholesterolemia protein; UB, ubiquitin. Yxx0, tyrosine-based endocytic sorting signal; [DE]xxL[LI], di-leucine-based endocytic sorting signal; [KR]n, basic cluster-type endocytic sorting signal a structure overall very similar to that of a-appendage, although the sequence identity is relatively low. The two subdomains of the 02 appendage contact each other at a tight interface leaving little space for motion. Both appendage domains serve as important platforms for the recruitment of accessory proteins. These interactions involve short peptide motifs within natively unfolded domains and will be discussed in detail below (see Fig. 1 and Table 1).